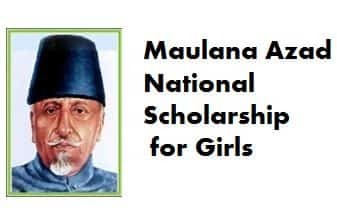 Begum Hazrat Mahal Scholarship is a National Scholarship Scheme given by Maulana Azad Education Foundation (MAEF) to the minorities girls studying in Class 9 to 12. Earlier it was known as Maulana Azad Scholarship For Girls. The objective of the Begum Hazrat Mahal National Scholarship is to recognise, promote and assist meritorious Girl Students who belong to the to National Minorities and who cannot continue their education without financial assistance. Girl students belonging to the six notified Minorities (Muslims, Christians, Buddhists, Sikhs, Jains, and Parsis) studying in Class 9 to 12 and have secured 50% marks or equivalent in aggregate in the previous class are eligible to apply for the scholarship. Get complete information on Begum Hazrat Mahal Scholarship 2018 on this page. This scholarship will offer selected girl students to get an opportunity to pursue their higher secondary education in India. The Scholarship Scheme of the Foundation is the very popular scheme and its sanctioning quota is increasing year by year. Till date, 2,75,744 girl students have been assisted with Rs. 328.72 crore by the Foundation since Inception spread all over the country. This scholarship is a Merit-based one-time scholarship and the students who got selected won’t be able to avail the scholarship again. Latest Update: The last date to apply for the Begum Hazrat Mahal Scholarship 2018 is 15 September 2018. Educational Qualification: Girl Students who are studying in Class 9 to 12 and passed with at least 50% marks or equivalent grade in the previous class are eligible to apply for Begum Hazrat Mahal Scholarship Scheme. Girl Students in receipt of any other scholarship do not qualify to apply for the Begum Hazrat Mahal Scholarship. No scholarship will be awarded to study abroad for any course. Scholarship Amount offered will be for the expenditure of school/college fee, purchase of syllabus books, purchase of stationery/equipment required for the course and payment of Boarding/Lodging charges. The students will be disbursed the scholarship amount as per the table is given below. Amount of scholarship will be credited directly into the Beneficiary bank account through DBT mode only. Sanction of scholarship amount: On completion of the required paper formalities, selected candidates will receive a sanction letter/cheque for the scholarship by Regd. Post. For Class 9-10: It is a scholarship for Admission and tuition fee of Actual subject to a maximum ceiling of Rs.10,000 (Rupees ten thousand only) which will be released in two instalments of Rs. 5,000 each. After successful completion of class 11, the scholars have to send the renewal form to the Foundation Office for availing the second instalment of their scholarship i.e. Rs.5,000 in Class 12. No renewal application form will be accepted after the prescribed time limit. Students once selected at any stage of the class have to submit their applications for renewal at the next stage of class, there is no need to submit a fresh application at every stage. Self Attested Mark sheet of previous class as filled in application form. Note: If the candidates not having their Aadhaar Card, still they can register for the Begum Hazrat Mahal Scholarship 2018 on the portal by Bank A/c Number with IFSC Code as Identifier. Submission at office personally: Candidates can also submit the application form personally at the Foundation office itself. The completed scholarship application form along with the required documents should reach MAEF office by 30 September 2018. The girl students who have applied for the minority scholarship scheme for girls can check the status of the scholarship by entering the following details. By checking the status they can know whether their scholarship has been accepted and if it is then they can know when will their scholarship will be credited into their account. Selection of candidates for Begum Hazrat Mahal Scholarship 2018 for the Girls belonging to six National Minorities will be based on the family income of the candidates. The candidates should be passed with minimum 50% marks in the previous class. There is a fixed number of scholarship quota for each State or Union Territories based on the minority population in the concentrated area. Students availing the Maulana Azad Scholarship for Minority Girls will be eligible for Shaadi Shagun Scheme. The annual income of the parents of the candidates must be below 2 Lac Per Annum.